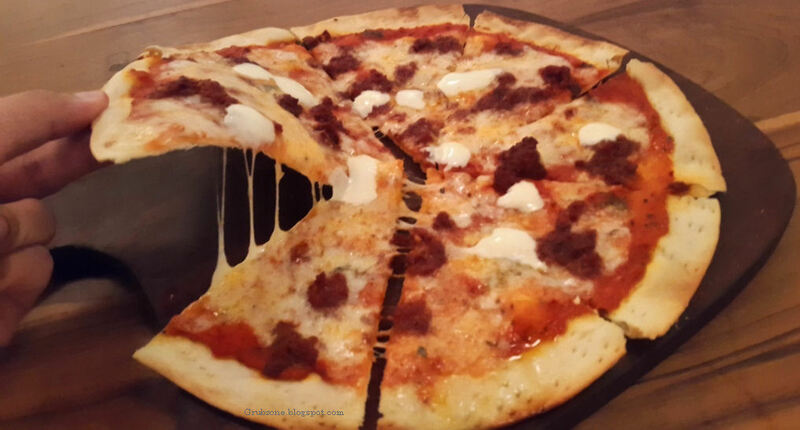 Grubzon - A Gourmet Voyage: AKA Restaurant - Worli, Mumbai. Stuck on a strange island, we decided to explore the place completely. There be some strange magic in these parts. Perhaps, we could find some information for me quest. We returned from our excavation in the jungle and saw a restaurant in the midst of the busy town street. It was hot and I could bloody well use some grub and grog. AKA can be a little hard to find for the first timer. Its hidden on a street behind the buildings on a main road. I suppose, calling it opposite the Nehru science centre works better for directions. I came here on a hot day. A single minute of walk in the hot summer sun had made me resemble a lost traveler in the midst of a scorching desert. AKA is huge. The dining area feels like a mix of many themes. 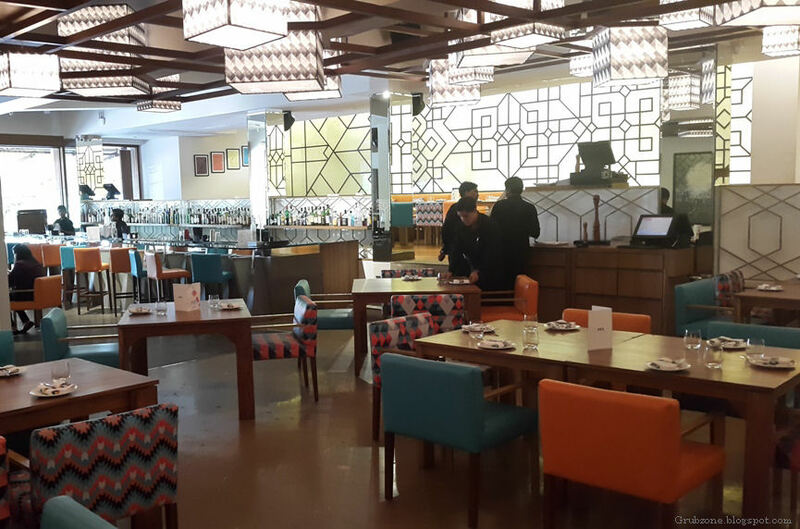 There are modern European, American and classical Indian style fine dining elements present here. The dim yellowed lights make the ambience appear golden. However, there seemed to be some issue with air conditioning on the day I dropped by. It was either running too low to be perceived or there was some unseen glitch. The temperature felt warm and slightly discomforting. At this point, you may probably be wondering why the restaurant is named AKA. I am that told it is based off the owner's initials. Three partners, three letters. AKA offers continental grub with a simplified menu which feels more like an elevator panel than a cockpit dashboard. It is thus easy to make a choice. The Performer was a simple molecular cocktail which was made of Vodka, Apricot Brandy and Cranberry tea. It was infused with smoke made of Rosemary, Thyme and orange zest. The drink was sweet(Candied kind), tangy and mildly potent. The smoke added to the zesty flavor. Good for fellas who want to keep it light. If you need something stronger then go for a more generic cocktail. Captain : Ah yes, good grog to beat the heat. Crewmate : I need some too Cappy. Captain : You can have the smoke. 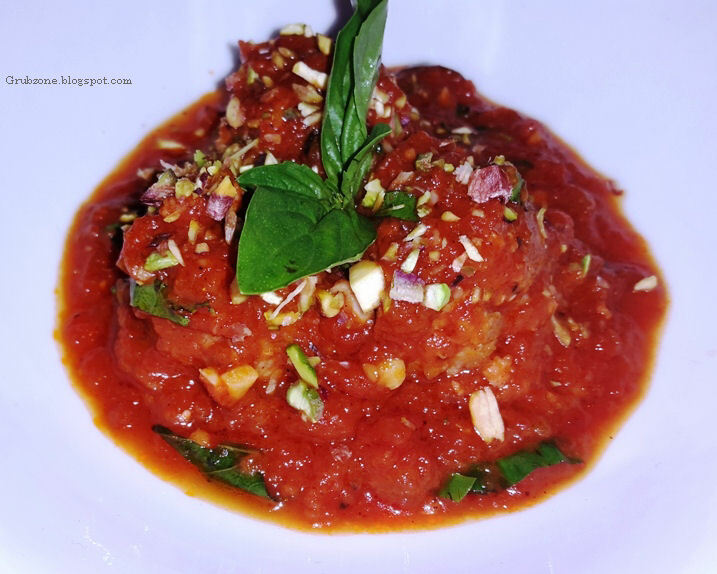 Lamb meatballs were made in a paste which was reminiscent of the Arrabbiata sauce. The balls were soft and full of flavor. The pistachio slivers on top added to aesthetics but not flavor. I am not used to having meatballs alone, preferring some form of roughage like pasta or at least some bread. I felt that a thin slice or two of Focaccia won't have been a bad thing. Mascarpone Chorizo Pizza was a decent pizza if one is to compare it with the likes of Dominoes or Pizza hut. But it wasn't quite a gourmet pizza. Mascarpone was far too less to make an impact on the flavor which was dominated by mozzarella. The base sauce was weak on chorizo as well. The flavor was clearly adapted to Indian palates. 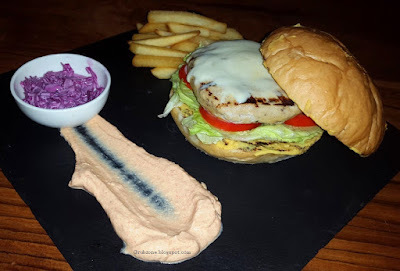 Chicken and Mascarpone Burger. The burger was quite salty and the patty a little chewy. This was a messy and juicy burger which had almost everything in the right place. But just like how a stray stroke can ruin a masterpiece in the making, the salt dampened the other elements. Chocolate Gianduja Mousse was an impressive looking dessert. A shallow stream of toffee sauce flowed in between two gigantic pyramids made of chocolate mousse along with mounds of whip cream with ultra thin discs of chocolate. The mousse was eggless but still tasted amazing. 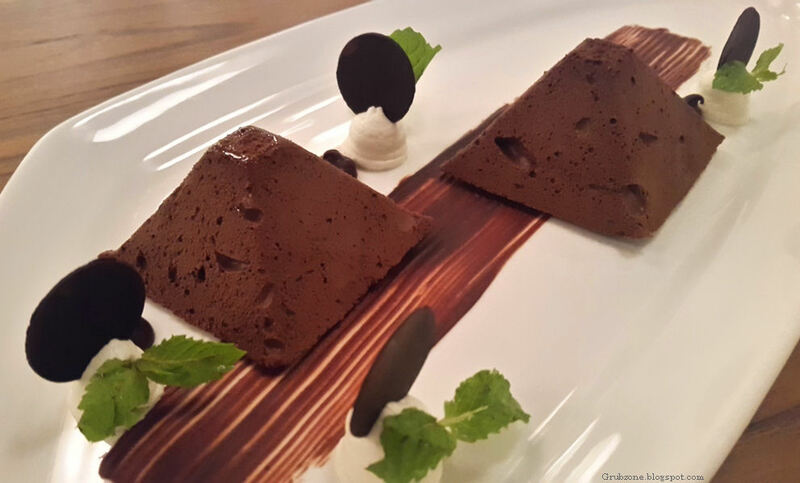 Very few dessert makers get an eggless mousse right. The dessert was a decent consolation over the salty mains. Its difficult for me to comment on the service as I was invited to sample the place and it was late in the noon with very few customers around. From my experience, I felt the service was professional and decent. The server knew his stuff. Captain : This looks pretty, just like one of those master chef desserts. Crewmate : Can I have a bite? Captain : Sure, I will keep the pyramids. You can keep the stream. The pricing is on the higher side. It feels a bit high for the drinks, appetizers and mains. But it feels cheap for the desserts. Won't mind if the prices are about a fifth lesser. AKA has got most of its elements right but it needs to work on the glitches. That being said, its a decent continental place and its current problems could just be teething issues. Captain : What is that rumbling? First Mate : Could it possibly be the empty stomach of your poor crew, you insatiable glutton? Captain : I am serious mate. First mate : Well, it came from outside. First Mate : What in the world! What is this? Captain : We are definitely getting close to that compass.